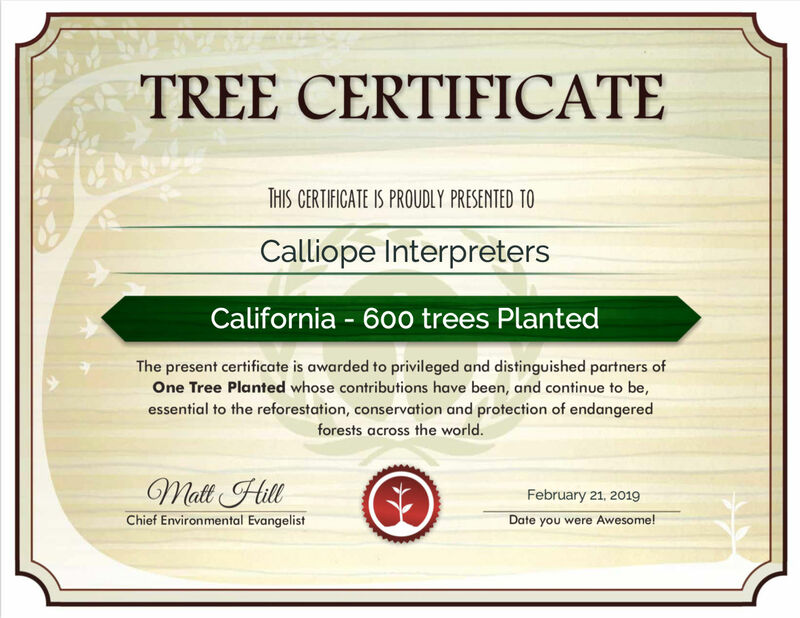 In January 2019, Calliope members unanimously decided to take a first step towards offsetting the network’s carbon emissions by planting 600 trees in California. This initiative builds on Calliope’s existing commitment to sustainable practices, which is now crystallized in its newly adopted Environment Charter. Calliope is proud to have supplied interpretation teams for many conferences on environmental themes, and not least for the last three IUCN World Conservation Congresses in Barcelona (2008), Jeju (2012) and Hawaii (2016). Inspired by those experiences, we began to reflect on the measures we could take to minimize our carbon footprint and contribute to greening the services we provide (for example by recruiting local interpreters, using public transport and choosing local products). Our next step was to raise awareness of environmental issues amongst our partners, by inviting them to use more sustainable modes of transport and to adopt a less damaging consumption model. Most recently, as a network, we decided to adopt an Environment Charter and to measure and offset our impact on the planet. To avoid or to offset? As consultant interpreters, we are specialists in providing the interpreters our clients need wherever they choose to hold their conferences. While we will always strive to recruit local interpreters to increase both the sustainability and value for money of our services, the choice of languages and conference venue will have significant implications for the distances interpreters need to travel, and therefore for the CO2 generated. While we do our utmost to avoid CO2 emissions by recruiting locally, and recommending our teams to choose cleaner modes of transport, to limit their water and energy consumption, and to keep printing to a minimum, we cannot avoid generating CO2 completely. Last year, we therefore decided to monitor our CO2 emissions with a view to offsetting them. The result: in 2018, the total CO2 generated by our interpreting teams’ travel, be it by plane, train or car, was a shade over 200 tonnes. It was clear that we needed to take action. In January 2019, Calliope members unanimously decided to make an annual contribution to an environmental association specializing in reforestation. 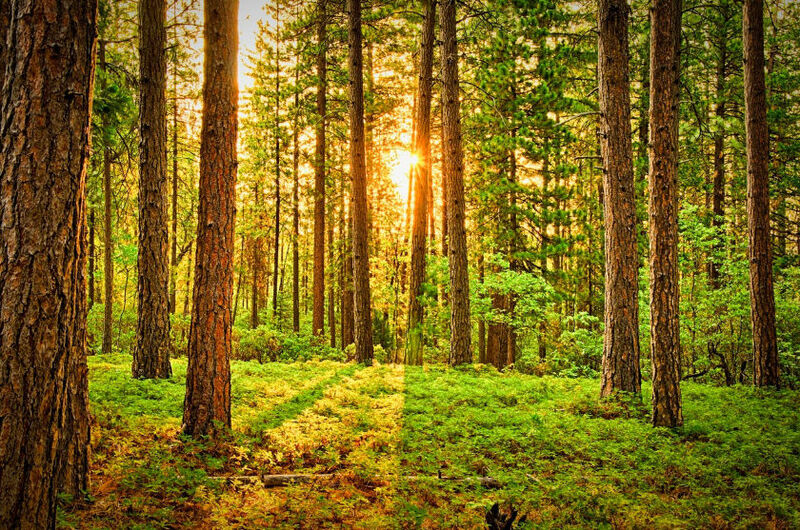 Why reforestation? Trees play a vital role on our planet: as well as being valuable carbon sinks, they contribute to the water cycle, prevent soil erosion and desertification, and provide a habitat for wild fauna, thus helping to preserve biodiversity. Trees are a symbol of life on earth. The organization which we have selected, One Tree Planted, is a relatively young NGO, based in the United States, which channels funding to reforestation projects all over the world (Europe will soon be added to its list), and has already proved its worth. This year, we have decided to plant 600 trees in California, which is in desperate need of reforestation as a result of drought and last summer’s devastating wildfires. This is Calliope’s first year of making a financial contribution to an environmental fund. However, that is only one aspect of our environmental commitment. We continue to endeavour to minimize the environmental impact of the interpretation solutions we supply, as well as to raise awareness of environmental issues among all our partners, be they interpreters, clients or suppliers. We believe that protecting the environment is our duty as responsible citizens of the world. Expert interpretation services do not have to cost the earth. Contact Calliope-Interpreters, your global network of consultant interpreters, to discuss your interpretation requirements. We will be delighted to help you minimize the carbon footprint of your conference.